Is It Time for a Change in Your Hemophilia A Treatment? With so many choices out there, it's time to narrow the field. What is important to you in a hemophilia A therapy? *FDA approved for 2 to 3 times weekly dosing. Once you've found a therapy with a twice-weekly dosing option* and ZERO bleeds (median AsBR†), other things can be taken into consideration. 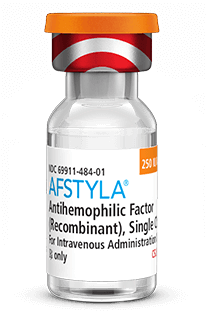 Of these 3 FVIII products, only AFSTYLA is covered by 3 of the largest national plans (pharmacy benefit managers). With more than 30 years of experience in bleeding disorders, CSL Behring remains committed to developing innovative therapies. ZERO inhibitors were observed in 258 previously treated children, adolescents, and adults in clinical trials. *FDA approved for dosing 2 to 3 times a week. How would you like to get your Doctor Discussion Guide? The email address entered above will only be used once to deliver your customized discussion guide. It will not be saved or used for any other purpose. Your discussion guide is on the way! Didn't get the email? Send it again. When you're ready to give AFSTYLA a try, simply print this form and give it to your doctor to request your free 30-day trial. All insured patients are eligible, including those covered by Medicare and Medicaid. Be sure to sign up for the latest information on hemophilia A and AFSTYLA—and request your free AFSTYLA Discovery Kit! If you need assistance, speak with a My Source™ Care Coordinator at 1-800-676-4266 Monday through Friday, 8 am to 8 pm ET. We're here to help. Explore My Source support available from CSL Behring. 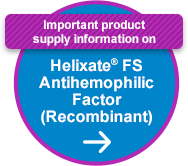 Helixate® FS, My Access®, and Biotherapies for Life® are registered trademarks of CSL Behring LLC. Mix2Vial® is a registered trademark of West Pharma. Services IL, Ltd., a subsidiary of West Pharmaceutical Services, Inc.